Having avoiding the insider trading spotlight for years, this morning Goldman Sachs finally succumbed to the greatest of indignities, when one of its employee was busted with insider trading. Woojae "Steve" Jung, 37, a Goldman TMT Vice President who is a Korean citizen and resides in San Francisco, was charged with securities fraud for using inside information about the investment bank’s clients to make $140,000 in illicit profits on 12 deals mostly involving Goldman tech company clients, while using a co-conspirator in South Korea to execute the trades. Jung, who had worked at Goldman since 2012, was charged with one count of conspiracy and six counts of securities fraud, for running the scam from 2015 to 2017 according to the SEC lawsuit filed in Manhattan Southern today (case 18-cv-04811). 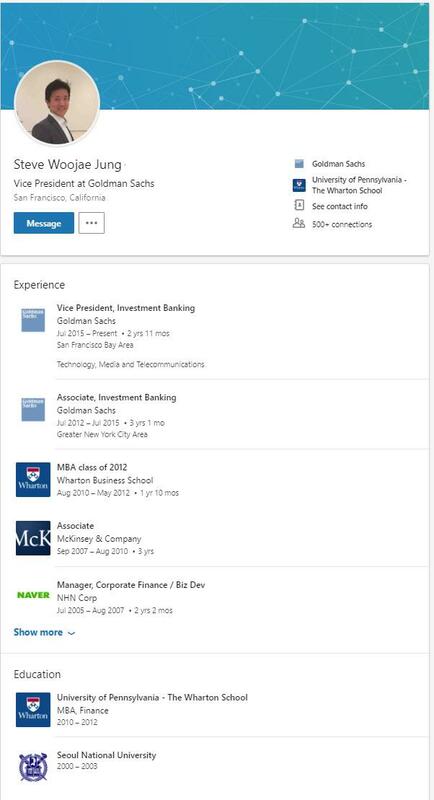 While Goldman Sachs wasn't identified by name in the complaint (where it is instead simply listed as the "Investment Bank") Jung’s LinkedIn page says he’s worked at the bank since 2012 after graduating from Wharton Business School. Using this non-public info of upcoming deals and transactions, Jung traded in the respective entities, while attempting to conceal his connection to the trading by purchasing the securities in a brokerage account held in the name of a friend living in South Korea, Sungrok Hwang. Over the course of the scheme, Jung generated illegal profits of more than $140,000. By engaging in this misconduct, Jung violated the antifraud provisions of the federal securities laws. As the SEC further details, Jung joined Goldman in July 2012, at which time he held a trading account in his own name at Interactive Brokers but as mandated by the Personal Trading Policy, Jung began the process of closing his Interactive Brokers account in September 2012. Jung then opened a new brokerage account at Fidelity Brokerage Services which was an outside brokerage firm approved by Goldman. The Investment Bank directly received copies of Jung's Fidelity account statements, reflecting his trading in that account. However, on August 8, 2012, a second Interactive Brokers trading account was opened in the name of Jung's friend, relief defendant Hwang. While Jung was not registered as a financial adviser, or other person authorized to access the Hwang Account, he nonetheless left his electronic fingerprints on the Hwang Account. In the months leading up to and during the course of the insider trading scheme alleged in this Complaint, Jung exercised control over the Hwang Account, accessed the account on hundreds of occasions, and used the account to, directly or indirectly, place illegal trades. Trades in the Hwang Account were placed through Interactive Brokers' electronic trading system. In order to place a trade through the Interactive Brokers electronic trading system, a user must first log in to the system using a unique login name and password associated with the account. And when a user successfully logs in to an Interactive Brokers account, the firm's computer server records the internet protocol address ("IP address") used by the user. Jung was the registered Verizon internet subscriber for the IP address 96.250.86.82. Jung was the registered Verizon internet subscriber for the IP address 108.46.157.109. Jung was the registered AT&T internet subscriber for the IP address 71.145.208.86. In many instances, including those detailed in Section C. below, Jung accessed the Hwang Account on the very same days that the account placed the illicit trades at issue in this action. Jung's three IP addresses collectively accessed the Hwang Account more than 600 times. In February 2014, an apparent relative of Jung who lived at Jung's residential address in New York, New York deposited $7,000 into the Hwang Account. In May 2015, one of Jung's former co-workers, for whom Jung had posted a professional recommendation on the Linkedln platform, deposited $19,000 into the Hwang Account. The day after this transfer, Jung, using an IP address with a history of logging in to Jung's Fidelity account, logged in to the Hwang Account. In early July 2016, an attempt was made to transfer $5,600 out of the Hwang Account to a bank account held by a friend of Jung. Interactive Brokers rejected that request as an improper transfer to a third-party account. Then, on July 10, an individual purporting to be Hwang called Interactive Brokers to inquire about the failed transfer. That call was placed from a cell phone number registered to Jung. What is surprising about this whole affair is that Goldman traditionally hires relatively intelligent people, whereas Jung acted like he wanted to get caught, typically buyiung either stock or worse, calls, of target companies - all of which were also Goldman clients - ahead of their acquisition. What is more surprising is that the total profit from all the individual deals was only $140,000. What is even more surprising is that it took the SEC no less than 2 years to put the case together. What is most surprising is that somehow we are expected to believe that "Steve" was acting alone at Goldman, although that's what happens when you piss of the wrong people.